Buying, and Karma, and Searching! Oh, my! The guys at BrickOwl have been working hard and I'm pleased to announce that they have now setup integration with Rebrickable! 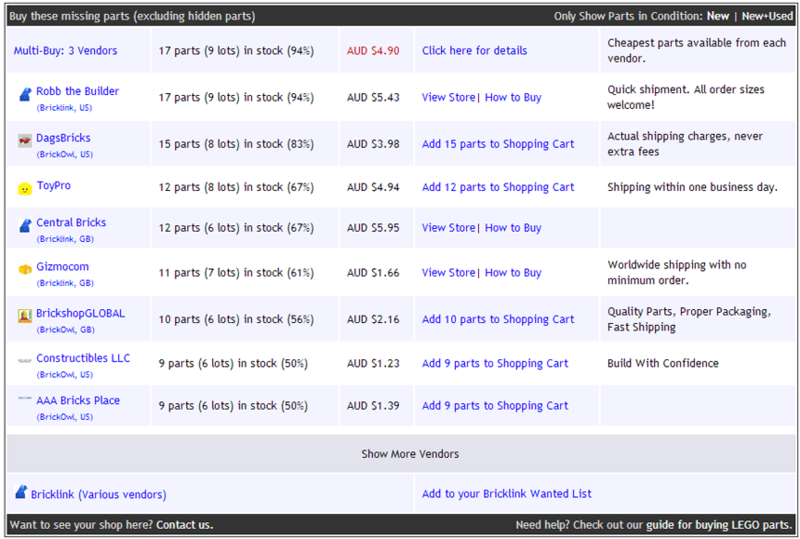 BrickOwl is a great new online LEGO marketplace where you can buy and sell LEGO parts or sets. The site already has hundreds of stores with more being added every day. Instant payments, made possible by the automated calculation of delivery fees every time you modify your shopping cart. The Wishlist which allows you to import items from file (e.g. Lego Digital Designer) and makes it easier to find the stores that stock those items. Similar to the Private MOCs feature here but also includes delivery fees in the calculations. Modern e-commerce site with all the functionality and security you'd expect. The buyers box now shows you some more information about each store such as what type of site it is and what country they are physically located in. As the number of stores grows I have had to limit the number shown, and provide an option to expand the full list. The stores are ordered so that the ones that stock the most number of parts that you are interested in are at the top, and then by the total cost. While this seems to favour only the large stores, most of the build results shown tend to have a small number of parts and so the smaller stores get a chance to shine. As long as they are cheap enough! The BrickOwl stores support automated shopping carts, so you can click the "Add to Shopping Cart" link and it will take you directly to that store's page and populate your shopping cart with the relevant parts. It also provides an instant calculation of the delivery fees. I don't agree on that! 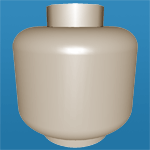 Bricklink may look and feel old. Don't be fooled by the modern look. The catalog is worse, which is to me the #1 reason to visit a Lego site. They suffer from the same child/New site symptoms as rebrickable alot of missing images or bad 3D images that sometimes hide the important difference of the part. which is the reason that I usually work with rebrickable and bricklink at the same time so I can know what the ID is. and that is because rebrickable fills another purpose then bricklink. The "Build" and "MOCs" feature. Brickowl doesn't have anything of the bells and whistle they need to really beat it. 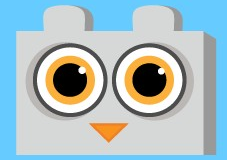 I don't see anything that benefit Brickowl that is worth what you loose. More and cheaper stores on bricklink. they have alot of work to be done before they can even compete. Who knows what bricklink 2.0 will bring so they have a race against time to make sure they don't only live on a modern look and eye candy. instant payment is hardly a major point, paying by paypal is secured and fast enough. Only time will tell, I think there is room for two sites and that is probably what will happen. buyers will check both. in the end is more likely the store prices that will matter, which site that get the sells. Well the bottom line is that you have to get your product out there at some point to let people start to use it. To think that you a sole developer can get every possible feature in at launch is not really possible. Who knows what is in store for Bricklink 2.0, I am sure they will do a good job. The site has done the job for many years and hope it gets the love it deserves. You just can't discredit a new guy though. Competition is good. I appreciate the effort and result so far for Brickowl. He has done a fantastic job and he is working hard on it to keep the improvements coming. Yes in the end, price wins and hopefully so do the LEGO fans. of course, but that also means that the statement "it already knocks the socks off the other place" will be false until he do get most of them in. A new site is bound to lack content compare to old. But since I am on the site because of the content, the site won't win me over until he can compete or have something real good the other site doesn't. I am not saying he is doing a bad work. I just saying its old site with large content base he is competing with and that takes alot of effort to win over a good deal of users from such a site.